Because of the belief of an afterlife, augurs or fortune tellers existed as intermediaries in ancient China religion. Augurs asked questions of the gods or spirits on behalf of the humans who needed their skills. 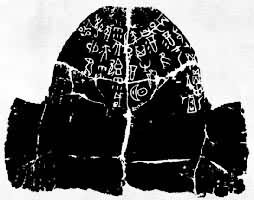 They used various techniques of divination, such as fire and oracle bones, to find the answers. The common questions an augur would ask were concerns about the future, such as how the harvest would turn out, who should be in an important position or who was going to win a battle. It's up to the augur's expertise to interpret the patterns on the bones or other divination tools to discern the answer from gods, spirits or one's ancestors. Their recordings on the bones or shells were the first written Chinese characters that have been found. Besides various gods, ancestors and the Tian as mentioned on this Ancient China Religion page, early Chinese people also worshipped the capable or the nobles who had contributed to the people in one way or the other. When these people died, they were worshipped as gods. Their statues or pictures were displayed on shrines to be the subject of worship. This custom is still kept by many today. 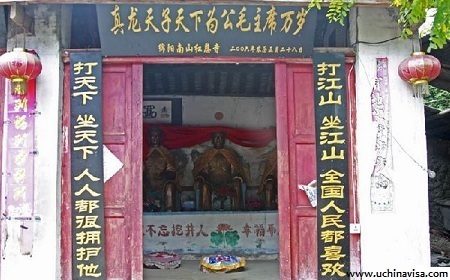 You might have seen the shrines of Guangong (picture at left), a well known lengedary Chinese warrior and a beloved character in the Three Kingdoms by Luo Guanzhong, at the entrances of many Chinese restaurants. 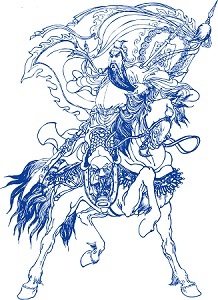 An example from modern China is Mao Zedong (Mao Tse-tung), who has been made into a god. See pictures below. Guangong worshipping in Dongyang, Hubei province 2009. Both Mainland China and Taiwan participated. 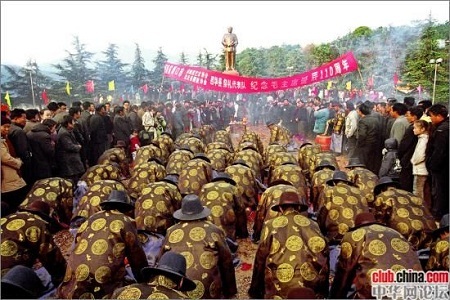 Mao worshipping in Shaoshan, Hunan Province, 2010.